On An Overgrown Path: Who needs a tuxedo? After free Beethoven downloads, Doctor Who Proms and targeting babies the new snake oil that will make classical music run smoothly is the tuxedo-less orchestra. No particularly strong views here either way other than that, yet again, we are confusing the parcel and the wrapping. If "the overarching problem of classical music" really is the tuxedo why aren't zenra orchestras selling out the Hollywood Bowl? If any reason is needed to defend dressing-up for concerts, it was seeing a tuxedo-less Andrew Davis conduct the Vaughan Williams anniversary Prom on August 26. Sir Andrew's take on concert-casual is not a pretty sight. I was going to put a screen-grab here but decided against it as I didn't want an adult advisory rating slapped on my blog. Taking the alternative point of view, a good reason for leaving the tuxes in the green room is that it gives visual parity to female musicians. My header image features Odaline de la Martinez, who not only does a wonderful job championing neglected contemporary music and as a composer in her own right but was also the first woman to conduct at the BBC Proms. Memory tells me it was in 1994 and the programme was a concert performance of Ethel Smyth's The Wreckers; but I can't corroborate that so confirmation or correction would be appreciated. Whatever the year I bet she wasn't wearing a tuxedo. Read more here. The webpage at the top of your post says that she conducted The Wreckers at the Proms in 1994, although the wording suggests that that was not her first Prom appearance. Philip, I suspected this was the case - hence my qualification. I cannot find confirmation of the date of Ms. de la Martinez's first Proms appearance. The answer may lie in the recently published Proms history overseen by Nicholas Kenyon but I don't have a copy. I know Norwich central library does and I am off to there in a few minutes to check. I will update if I find the answer. 'As one of the most interesting personalities of the contemporary musical scene, Odaline de la Martinez was the first woman conductor of the entire programme at the Proms in 1994'. A Lontano CD in my collection asserts that Odaline de la Martinez was the first woman to conduct at the Proms in 1984. Indeed according to my Proms guide she made her debut that year on August 20th with a programme of Gerhard, Hugh Wood and Schoenberg. However earlier that season Iona Brown directed the Academy of St. Martin-in-the-Fields, having made her debut in 1979 on August 9th with Bach, Bartók and Mozart. None of these performances was trumpeted as the first for a female director or conductor - perhaps another came earlier? Ian many thanks for that very useful information. 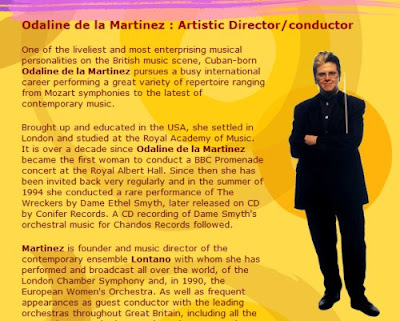 I remember reading somewhere that Odaline de la Martinez was the first woman to conduct a complete Promenade concert. It seems unlikely, but could it be that the Iona Brown concert was shared with another conductor? Philippa Schuyler - genius or genetic experiment? Is this really the future of classical music?